It’s been awhile. I will do a better post soon but I had this one written and thought I’d better throw ‘er up there. It’s about bathrooms. Here are some descriptions of the bathrooms I encounter. My home bathroom is quite large! It’s about 1/4 of my entire apt. Much larger than most people’s bathrooms actually, despite the fact that my apartment is much smaller than everyone else’s. It consists of the usual things, like a toilet (which I’m not supposed to put toilet paper in but do), a small medicine cabinet (filled to the brim with my random belongings), a mirror, a drain on the floor and a shower head on the wall right beside the sink. I also have a shower curtain. This prevents the entire room from getting covered in water, but the floor is still soaked. I squeegee it off afterwards and usually wander in and out post shower and soak the bottom of my pjs or my socks. I had to buy slippers to wear in there. I now own 2 pairs of slippers for my apt the size of a regular bathroom. I don’t really have to wash the floor though. Is pretty gross. These are the ones that you have to go to at a coffee shop or restaurant. It does not contain toilet paper. It MAY be a squatting toilet. It does not have soap, or if it does have it, it will be a tiny ball of used hard soap that thousands of other hands have used. It will smell ferociously like urine.There will be no paper towel. There will be no hot water. There WILL be a garbage bin filled with pee and feces crusted toilet paper because the pipes can’t handle it. This from a country that has one of the best (the best?) subway system in the world and can build an entire anything in 3 days. It usually isn’t in the restaurant/store that you are in when you realize you need a toilet immediately. You will probably have to go outside, down 2 flights of stairs to an unmarked room with a codepad on it and you will have to type in the code that someone who doesn’t speak English has told you. It will probably be unisex, so some man can walk in on you at any time. Has 2 regular toilets and 6 squatting toilets in each room. It’s important to note that squatting toilets ARE better for your health. However, they’re awkward to use and I’m always worried I’ll pee on my pants or fall in or something. Anyway, there are always little girls in there screeching at the tops of their lungs. There are usually at least 3 children in a stall at one time. They like to go in together. They will come out and yell “TEACHER!!!! !” and then “HI TEACHER!! !” and then skip away and not wash their hands at all. They probably didn’t use toilet paper because they would have had to bring it from their classroom as it is not supplied in the washrooms. There is soap there. It will always be a bar and it will always be covered in brown grime. I always wonder if it’s better to use it or not. There will not be paper towel. There will probably not be hot water. There is rarely a hand dryer, although sometimes there is. If there is, it will be cold air. It will smell SO MUCH like pee. When the ajummas go to wash it, they will throw water over the entire floor, all over the toilet, and it will smell more like urine than before. But now everything is just soaked in water. That’s how you know it’s been cleaned.There might also be some children playing tag in there. Or someone might be brushing her teeth. 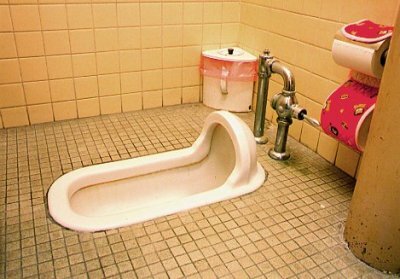 When I first arrived I wondered if there was a special washroom I should use as a teacher. They said, “At the end of the hall!” So… the regular washroom. My presence is always a surprise and a cause for conversation about me. I am mostly the only one to use the regular toilets. All of my co-workers use the squatting ones and can do so in about 1 minute, even though they’re definitely wearing heels and a skirt. They will possibly not wash their hands. better for you but do i care? Some bathrooms are amazing. They are clean.They have heated toilet seats which can also be a bidet, or a variety of other things I haven’t tried. They have liquid soap, paper towels, amazingly fast hand dryers which make my skin flap around. They will possibly smell like smoke though, because women like to secretly smoke and it’s not really acceptable in public. It’s illegal to smoke in there, but the fine is about $20. These are usually found in movie theatres, upscale restaurants and malls. OR. Subway stations. Seoul has the best subway bathrooms (and often bathrooms). I’m pretty sure they’re rated as the best subway bathrooms in the world. They are always clean, have soap, toilet paper, smell fine and there’s probably an ajumma hanging out in there cleaning. It’s so strange coming from the land of the TTC where you’d rather die than use the Finch station washroom. I did once and barely lived to tell the tale. 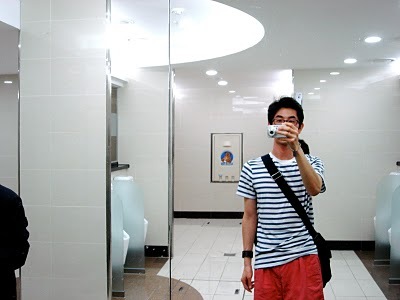 heres some guy using a seoul metro bathroom.